Looking at a map of the metropolitan areas of the United States, it would be easy to get the impression that “urban sprawl” had consumed most of the nation. Indeed, as Figure 1 indicates, one could drive from Santa Rosa, north of San Francisco to the Arizona-New Mexico border without ever leaving a metropolitan area. This more than 1,000 mile trip (1,600 kilometers) would take nearly 15 hours, according to Google Maps. New Jersey is shown as all-metropolitan, as well as Delaware. But looks can be deceiving. According to US Census data from 2010, the land area of New Jersey is 60 percent rural, while Delaware is 80 percent rural. Given the multiple terms used to describe urban and rural geography, confusion is not uncommon. It begins with the fundamental matter of terms. 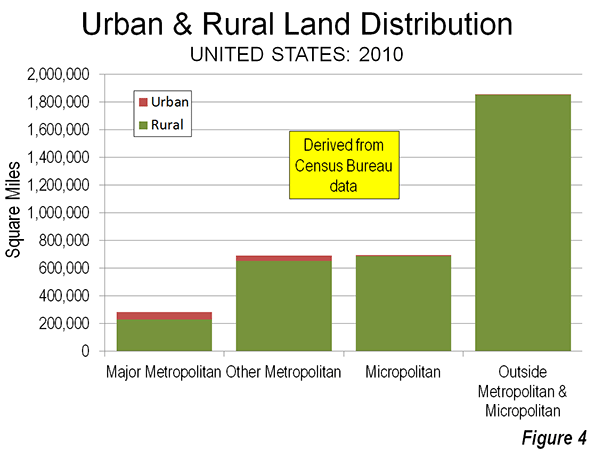 For starters, “metropolitan” is not the same thing as “urban,” and “rural” does not mean non-metropolitan. In fact, most rural residents in the United States live in metropolitan areas. All land within the United States is either urban or rural, without respect to whether it is in metropolitan areas. The Census Bureau defines urban areas using “census blocks” to which minimum population density criteria are applied. Census blocks are very small neighborhood units, which are far smaller than virtually all municipalities. This approach produces an urban area defined by land use characteristics, without regard to jurisdictional (city or county) boundaries. Urban areas contain no rural land. Metropolitan areas always have large areas of rural land. This is due to the very nature of metropolitan areas, which are designated by the US Office of Management and Budget (OMB). Metropolitan areas are labor markets, defined by commuting patterns. People commute to jobs in metropolitan areas both from within the core urban area (such as the New York urban area) and from areas outside the core urban area that remain in the metropolitan area, such as the non-urban parts of the New York metropolitan area (examples are much of Orange and Dutchess counties in New York as well as Sussex and Hunterdon counties in New Jersey). Each metropolitan area is organized around “central counties” that include a core urban area (area of continuous urban development). The core urban area must have at least 50,000 residents for an area to qualify as metropolitan. “Outlying counties” are also included in metropolitan areas if 25 percent or more of their resident workers commute to the central counties. This central counties and core urban area approach reflects the evolution of US metropolitan areas to the more dispersed employment and residential patters that have materially reduced the influence of the historical core municipalities (sometimes called “central cities”). On average, only about 10 percent of employment in the 50 largest urban areas was in the formerly more dominant downtowns in 2000 (central business districts). The land area in America’s metropolitan areas is much more rural than urban. More than 90 percent of metropolitan area land is rural. In 2010, 28 percent of the nation’s land area was metropolitan, but the urbanization in metropolitan areas accounted for only 2.6 percent of US land area. 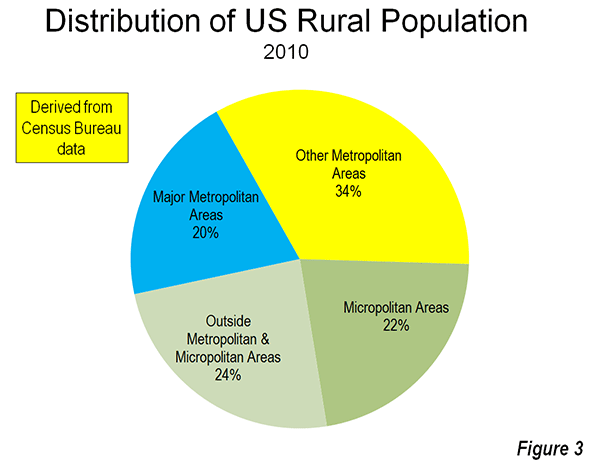 In 2010, 32 million of the nation’s 60 million rural residents lived in metropolitan areas (Figure 3). 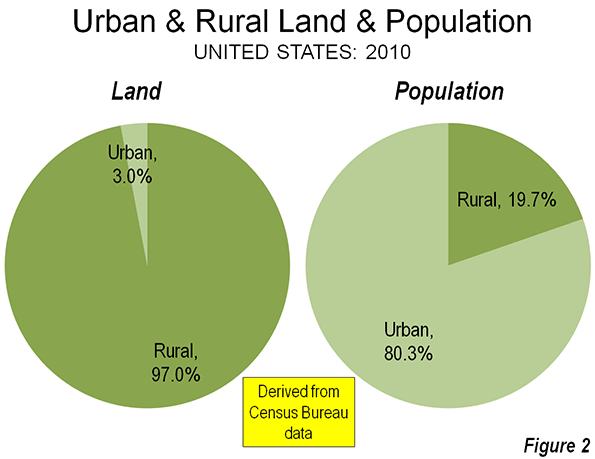 On average, 81 percent of the land area in major metropolitan areas (0ver 1,000,000 population) is rural, not urban (Figure 4). There is a wide variation among the major metropolitan areas. All but one of the major metropolitan areas has more rural land than urban land. Boston has smallest rural land area share at 43 percent. The New York metropolitan area clocks in at 52 percent rural, Philadelphia at 54 percent rural and Tampa-St. Petersburg stands at 55 percent rural. At the other end of the scale, the Salt Lake City metropolitan area is 96 percent rural, followed by Riverside-San Bernardino at 95 percent, Las Vegas 94 percent and Denver 92 percent (Table). The most important reason for the difference in rural area size within the major metropolitan areas is the differing sizes of counties. In the East, Midwest and South, counties tend to be much smaller than in the West. For example, the New York metropolitan area has nearly 20 million residents, distributed among 25 counties. In contrast, the Los Angeles metropolitan area, with 13 million residents, is composed of only two counties. The metropolitan areas with the most rural area are largely desert and mountains (see top illustration of the Riverside-San Bernardino metropolitan area). Large counties in Utah extend the Salt Lake City metropolitan area 100 miles westward to the Nevada border. Riverside-San Bernardino’s two large counties include a land area nearly equal to that of Ireland, stretching more than 200 miles to the Nevada and Arizona borders and including part of Death Valley National Park. In both cases (and a number of others), large counties require metropolitan areas to be far larger than any reasonable commuting shed. This size variation renders population density figures for metropolitan areas nonsensical (building blocks would need to be small, such as the census blocks used by the Census Bureau to define urban areas). The major metropolitan areas of over 1 million contain nearly 12 million rural residents, or 20 percent of the nation’s rural population. While this is a large number, their urban populations are much greater, at 158 million, or 63 percent of the US urban population of nearly 250 million. These urban residents live in a smaller proportional area, constituting of only one-half of all urban land area (and 1.5 percent of all US land area). The rural portions of metropolitan areas with fewer than 1,000,000 residents cover 94 percent of their land areas. These areas include approximately 20 million residents, or 34 percent of the nation’s rural population. Only six percent of the land area in these metropolitan areas is urban. This leaves a minority of 27.5 million rural residents living outside the metropolitan areas. Micropolitan areas are defined by OMB as labor markets with core urban areas between 10,000 and 50,000, and are not considered metropolitan. Approximately 98.5 percent of the land in micropolitan areas is rural. The rural population of micropolitan areas is 13 million. The other 14 million rural residents live outside the micropolitan areas. 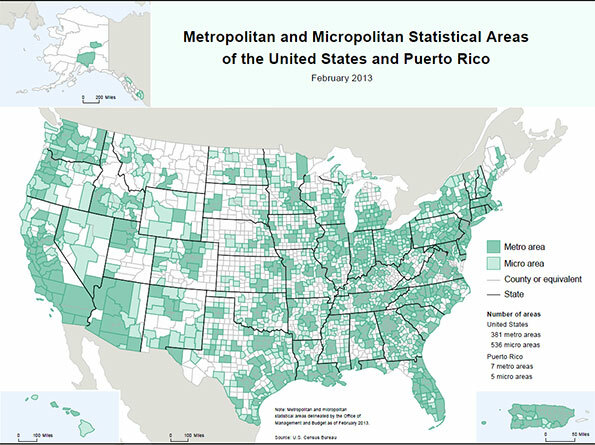 However, there are still 4.7 million urban residents outside both metropolitan and micropolitan areas, with each of these urban areas having fewer than 10,000 residents. Even where America is most urban, a strong rural element remains. 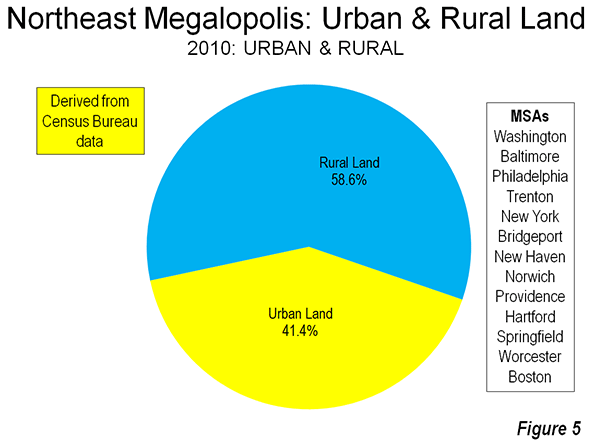 This is illustrated in the Northeast Corridor, the “megalopolis” defined by Jean Gottman more than a half-century ago. The urbanization he identified is still short of continuous along the corridor. Rural areas interfere with urbanization in parts of Maryland, New Jersey, Connecticut and Massachusetts. Nearly 60 percent of the land area in these adjacent metropolitan areas remains rural (Figure 5). The numbers are even smaller elsewhere. Between Dallas-Fort Worth and Houston, 80 percent of the corridor is rural. Between Seattle and Portland nearly 90 percent of the corridor is rural. These are among the busiest corridors in the United States, and many more are far more rural. Up close and in context, the spatial urbanization of America, including its metropolitan areas is not pervasive. Submitted by C. P. Zilliacus on Thu, 12/12/2013 - 16:28. (1) The mainline of the New Jersey Turnpike north of Exit 1, in Gloucester and Salem Counties, is largely undeveloped agricultural and forested lands. (2) U.S. 301 (a viable and mostly high-speed alternative to I-95 between the eastern suburbs of Washington, D.C.; Annapolis and northern Delaware) on the Eastern Shore of Maryland between Queenstown and Delaware municipality of Middletown crosses long stretches of flat to very gently rolling land covered by forests and reasonably large-scale farming operations. No apparent shortage of farmland.